iP3: Apple disabling non-developer devices running iOS 5? Apple disabling non-developer devices running iOS 5? According to a report from Karthikk (via AppleInsider) Apple is disabling “non-developer” devices that are running iOS 5. The move may seem unsurprising but we have our doubts, like TUAW. Apple, earlier this week, disabled all iOS 5 devices that were running betas 1 and 2. Our iPad running beta 2 was disabled as well – and it is registered to a developer account. Theoretically, there is no way that Apple could know if a device running iOS 5 is not being used by a developer. 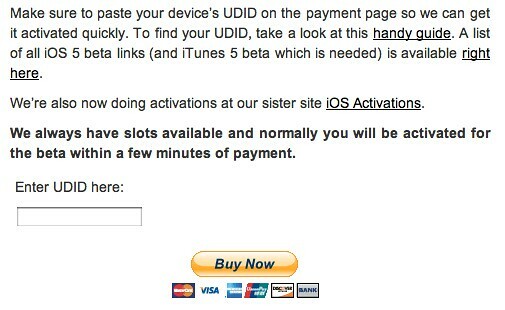 Apple provides 100 UDID slots to developers so they can beta test their upcoming software with many iOS device users. Apple does not ask developers to specify which UDID actually belongs to the developers. Apple has no way of telling if people are using the devices just to test the new iOS or to beta test upcoming App Store applications. The thought of Apple doing this simply makes no sense to us. On the other hand, the report also claims that Apple is going after developers who are selling UDID slots to people who want to give the new operating system a spin. First of all, there is no way Apple could know who is selling developer slots unless they specifically advertise their business – like some people do. The people who choose to sell slots without advertising online are likely safe from Apple. My iOS developer account was disabled by Apple recently, last month, as it had appeared that I was breaking the agreement (iOS PLA) by distributing Apple confidential data. Granted, I was selling UDID slots. In summary, we doubt that Apple is disabling “non-developer” devices running iOS 5. It does appear, though, that some sellers of UDID slots are being shut down.